Instagram recently announced it was purchased by Facebook. 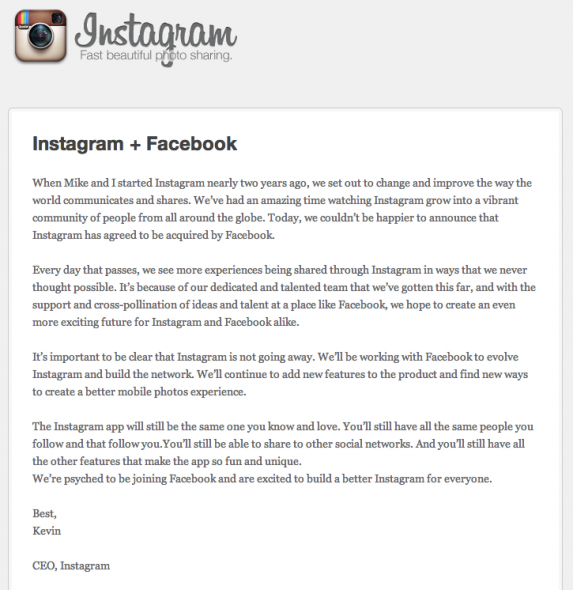 In their blog post the current Instagram CEO said the app will “still be the same one you know and love. You’ll still have all the same people you follow and that follow you.You’ll still be able to share to other social networks. And you’ll still have all the other features that make the app so fun and unique.” It’s been said that the sale price was $1 billion dollars. Feedback so far from the community is not so positive expecting Facebook to ruin the app/service. Here’s the official info from Instagram.